Ring News 24Boxing News Breaking Boxing NewsWill Jeff Horn hold onto his WBO title through 2018? Will Jeff Horn hold onto his WBO title through 2018? Manny Pacquiao lost his last fight against Jeff Horn, seen here. As we look closer into the 2018 calendar year, many matchups stand out. On April 21, it is likely that WBO welterweight champion Jeff Horn will defend his title against two-division world champion Terence Crawford at a location in Las Vegas. Horn vs. Crawford isn’t a fight without it’s upside, but it also isn’t the first fight that comes to mind when people envision Crawford’s most appealing fights. To get a better sense of Jeff Horn’s championship status, it’s best to look at his resume to get a gauge on just how new of a face he is on the boxing scene. Horn sports an overall 18-0-1 record with 12 knockouts. He turned professional on March 1 of 2013, stopping Jody Allen in the second round. Nearly all of Horn’s bouts have taken place in Australia, with his only career blemish being a technical draw with Rivan Cesaire. Horn’s big moment, of course, came last year when it was announced that he was going to be facing off with living legend and eight-division world champion Manny Pacquiao. Prior to the contest, Horn was an obscure name, as his only two notable wins came over former power-punching champion Randall Bailey and tough contender Ali Funeka. 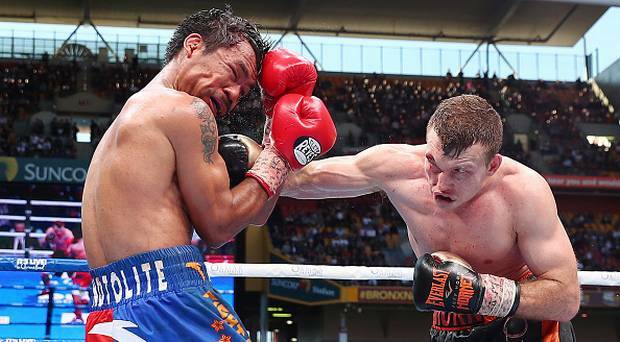 Horn fought valiantly against Pacquaio, however, and managed to escape with a decision victory on July 2, 2017 inside of Sun Corp Stadium in Brisbane. It was a bloody brawl and after 12 rounds of action, scorecards reading 117-111, 115-113, and 115-113 were read in Horn’s favor to his hometown crowd’s delight. Horn instantly became a name in the boxing game, as well as a champion, all in the same night. He followed the Pacquiao upset with an 11th round TKO victory over Gary Corcoran in December to set the stage for a potentially big run in 2018. But the question remains; how long will Jeff Horn hold onto his title? The welterweight division in particular is one of the hottest in boxing, with big names like Crawford, Errol Spence, Shawn Porter, Danny Garcia, Keith Thurman, and others all lingering. Knowing how Top Rank puts together fights, it’s very well likely we will see Horn vs. Crawford next, as the only other rumored option for Horn was a matchup with countryman and former champion Anthony Mundine. If Horn faces off with Crawford, he will surely have his hands full despite the fact that it would be the Nebraska native’s first fight in the welterweight class. Crawford brings things to the table that Horn has yet to see, including sharp reflexes, an unorthodox, athletic style that comes from all angles, and a pedigree that is one of the best in the sport. Horn’s rugged, sometimes aggressive style may not allow him to have early success against Crawford, as he will have to likely work his way into the match as the bout plays on. Also, the fact that Horn will be fighting away from his hometown, where he is so familiar, will likely play a role into things. Even after the Crawford bout, win or lose, it remains to be seen how long Horn will remain a champion in the welterweight division. 2018 will definitely be a telling year for the Australian.